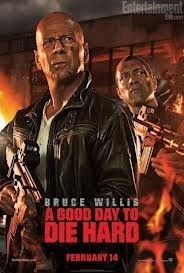 John McClane is back! And this time he’s On Vacation. Following reading a lot of reviews that dubbed Die Hard 5 as boring and subtitling it “A Bad Day To Die Hard” I wasn’t expecting much from the fifth instalment in a series of films which I thought peaked with the third and fell away with an average fourth film. But I was pleasantly surprised by Willis’ latest outing in the white vest. The story centres around McClane’s son, Jack, who is working as an undercover CIA agent who is aiming to stop all out carnage between two men. Naturally John is looking for his son and stumbles across him at the most inconvenient of times, slotting himself slap bang into the middle of the action. Bruce has still got it. Sure, he’s older, but the craziness still exists. There’s plenty of comedy to be had mainly revolving around the disfunctionality of McClane’s family life, but the film really comes to life during its action sequences which are as good, if not better than they have ever been. One early sequence involving a huge chase through the streets of Russia is insane and ends awesomely, and TW climax of the film is much more explosive and fun than anything in Die Hard 4.0. Forget the horrific reviews the critics have given this, go see the film and judge for yourself. Is it the best of the series? No. But it is entertaining and will raise a few chuckles as well as a lot of “Woah!” moments. This entry was posted in Movies and tagged A Good Day To Die Hard, Bruce Willis, Cineworld, Die Hard, icheckmovies.com, Jai Courtney. Bookmark the permalink.